It was one of lunch dates that should have been a good, even great, date. The phone conversations had been lively and we had similar backgrounds and interests. So, with the top down on his vintage sports car, we headed over the hill to Half Moon Bay late one autumn seeking a restaurant with a view of the water. It was a very busy restaurant, filled with the Sunday brunch crowd. Let’s split an appetizer and then he left a tiny tip. I slipped the waitress an apology tip and later declined his request for a second date. But he didn’t know that then, so when we left for the ride back, he turned down a side road off Hiway 94 into one of the many small, local wineries. At the end of the long graveled drive was a large barn and collection of mid-size metal outbuildings, each with a heavy barn door. The barn was home to the winery and tasting room while the smaller buildings showcased artisans who were all focused on their crafts. He swung around in front of one of the larger outbuildings, parked and said Let’s go in. I have to pick up a package. We walked through the open doorway straight into an enormous blast of heat. There, amid the blazing furnaces, were heavy insulated mitts, long iron rods, tongs, anvils, forges and an array of powdered dyes. The molten glass had been formed into pumpkins, paperweights, bowls and what could only be described as enormous ice sculptures. It was simply amazing. The artist-in-residence, a soft spoken loan officer during the week, finished breathing life into the hot white glass, looked up, removed his safety goggles and greeted us. The package was exchanged while I looked closer at the array of unique sculptures. The glassblower inquired, Do you have a few minutes? Come here — yes, you, come here. What would you like to make? I ventured nearer, the heat from the furnace becoming more and more intense. He held out mitts, goggles and a long black metal rod and nodded towards a number of small glass items…a paperweight, a pumpkin, a heart. The heart. I’d like to make a heart. And, just like that, the safety goggles were protecting my eyes while my hands and forearms were encased in the large insulated gloves and holding a very heavy rod with a glob of molten glass balanced on the end. Focused only on the glass, the rod and his patient instructions, I turned the iron rod and white mass round and round over the flames. Then, swoosh, he had his arms around me, gloved hands over mine, lifting my arms, the rod and hot glass to the colored powders. I just smiled, suspecting he had never heard of a healing heart. I sprinkled a pinch of the dusty green powder onto the hot white glass. 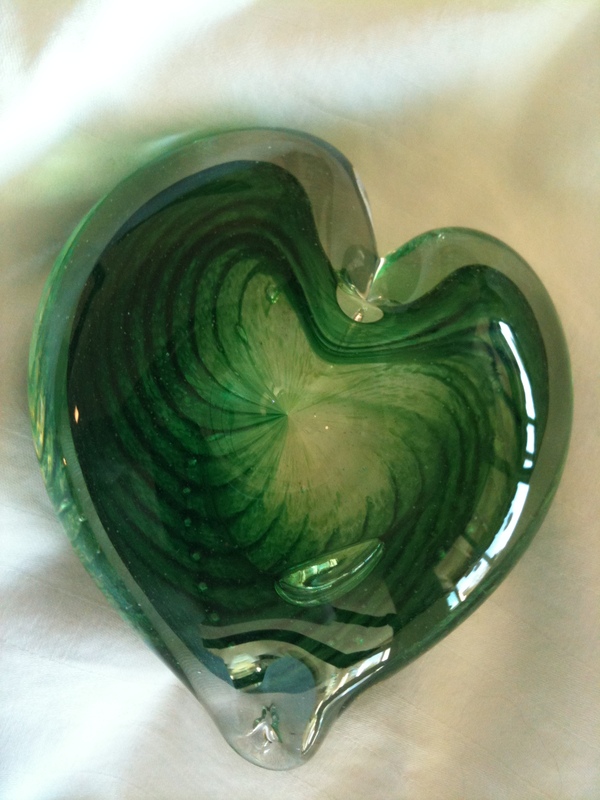 And then, a quick turn to a steel anvil and together we shaped the blob into a heart as the rich green shades swirled into an unexpected design. Another quick turn and the heart disappeared into the kiln. I’m not quite sure what I expected, but I drove up the Peninsula later the next week to retrieve the finished project from the glassblower-turned-loan agent who greeted me with the same gentle smile. He had carefully wrapped the heart and presented it in a small white box. I opened the box, unwrapped the tissue, ever so gently held the green heart in my hands and caught my breath at its beauty. No, it’s flawed. There’s a bubble. I looked closer. There it was, not a bubble but a small, almost imperceptible teardrop in my heart. Measuring, cutting, assembling and sewing 1080 pieces of flannel material and batting proved to be less a challenge than I had been led to believe. Almost like magic, woodland animals, paw prints and muted forest colors fell into a mosaic and the mosaics sewn into five quilts. At this point in time, I could face anything. My daughter and daughter-in-law each called to find out about the plans for Thanksgiving and what they should bring. Casually, I mentioned I had finished the Christmas gifts for the kids. I was having some misgivings. The four boys, in particular, had always gotten rough n tumble-type presents and quilts probably weren’t in that category. My daughter just mused, Quilts? Oh…. My daughter-in-law was more direct, Quilts? For the boys? Really? Really? What were you thinking? By Thanksgiving, I wasn’t sure the whole idea was going to fly. But the idea had gone long past concept and the five quilts were finished, neatly folded, stacked and tucked in the back of my closet. Within minutes of arriving, both daughter and daughter-in-law said, ok, let’s see them. I could almost hear the unsaid background conversation, Boys. Quilts. Geez…. The girls disappeared down the hall and into my room. Dead silence. I went back to my room, not quite knowing what to expect. These are beautiful! They’re amazing! The kids are going to LOVE THEM! Where’s ours??? On Christmas day, surrounded by mountains of toys, Christmas wrapping and ribbon, the grandkids tore into their last gifts, the bags holding the quilts. At first, they grinned, and then, following the youngest’s lead, wrapped themselves into the cozy flannel. Late that evening, the kids curled under the blankets in front of the dying embers of a Christmas fire. Exhausted from the day, eyelids heavy with sleep, they looked up at me and murmured, Awesome, Grandma, awesome. Six years later, all five kids still use the quilts all winter, either on their beds or and just snuggled up watching TV or reading on cold evenings. Truly awesome! I love making rag quilts. I’m an addict. I admit it. It’s a semi-creative, meditative activity. A small cuddly flannel quilt can be assembled and finished in less than five hours, a perfect evening or winter’s afternoon project. By watching for sales, the cost can be held to under $15 a quilt, a bargain if there ever was one. The challenge was what to do with them. Enter Project Linus, a non-profit organization that distributes homemade blankets to needy or traumatized children and local community groups that distribute lap blankets to needy seniors in nursing homes. Fortunately, there was a small shop near my home that specialized in vacuums and sewing machines. I’ve never quite figured out the connection between the two and why they’d be showcased in the same store. Probably something to do with domestic engineering. Filled with confidence and knowing that the machine simply had to sew a straight stitch, I walked into the shop. An elderly man approached to help. I need a simple sewing machine, I announced. I’m making quilts for my grandchildren. He immediately steered me towards a complicated, expensive machine that did everything but cook dinner. I shook my head. I’m only going to use a straight stitch. Straight stitch. It’ll never see reverse. I’ve got just the machine for you. And, he did. It’s still working like a champ. Straight stitches in its sleep and still has never been in reverse. I know this happens to many of us, but it still didn’t temper the stark realization that, with my mother’s passing, I had become the eldest and therefore the matriarch of our family. Time that had seemingly stood still for so many years had overnight become a premium commodity. That was never so evident as in watching my five grandchildren fly through infancy, toddlerhood and now launching into elementary, middle, high school and college. I was still sorting through my mother’s “stuff” when it suddenly dawned on me that I wanted to leave my grandkids more than boxes of photos and keepsakes. The idea festered a while in the deep recesses of my mind and finally bubbled up as a Christmas project. I’d make each of the kids a quilt. It was September. I don’t sew. I barely cook. Domestic activities of most any kind are a foreign language, although at the time I suspected I’d probably need to buy a sewing machine before embarking on this adventure. I wandered in and out of a number of quilt shops, looking a bit like a deer caught in the headlights of an oncoming train. Sales people avoided me, no doubt sensing that I’d be a time toilet. By mid-October, I had a nagging feeling that I needed to get this show on the road so I marched into a small quilt shop. The owner approached me and asked if she could be of service. I want to make quilts for my five grandchildren. That’s quite a project but we can help you. Do you want to have them made? Anticipation was now in full swing and the words tumbled out in one hurried breath. Oh no, I am going to make them. It’s a grandma thing. And, the quilts have to be large as the kids are all taller than me. And, I want them to be finished by Christmas. The entire shop burst out in wild laughter. For a moment, I thought of bolting through the door, but I stood firm. I had come this far and I was going to make five quilts. By Christmas. Then, from the deep recesses of a storeroom, a voice called out above the pandemonium. Show her how to make a rag quilt! Instantly, the shop grew quiet and a soft murmuring of approval replaced the mirth. Possible, said the owner. Very possible. How well do you sew? I need a sewing machine. What’s a rag quilt? Two hours later, arms overflowing with acres of flannel material, batting, a cutting board, ruler, clippers, scissors and thread and clutching a torn sheet of paper with scribbled instructions, I was exhilarated and exhausted. I still needed a sewing machine. Most women have coped with a lifetime of low self-images. Add a few decades and our bodies are no longer youthful. Waists have softened and disappeared into round bellies, deep blue veins map the years on our legs, skin turns to parchment and wrinkles around stretch lines regardless of the creams applied and, as Maya Angelou so wryly noted, (my breasts) are in an incredible race to see which one will touch my waist first. It’s one thing to snuggle in bed with your partner and lover of 40 some years, the man or woman you’ve grown up with and whose body is as familiar as your own; it’s another to come to terms with the reality of your aging body viewed through the eyes of a new lover, no matter how strong the attraction. Thank the goddesses that most senior men don’t care. Or else have very poor eyesight. I feel for single senior men, many of whom have their own set of issues, typically starting and ending with performance. Many swear, online, that they have the body and stamina of a 40 year old, although they sure look their age to me. Some change the topic from libido to Rhubarb. Others are more forthright and I admire them for their candor. One such man visited my online profile, so of course I read his. He had me with his opening paragraph. Age is better – I have been young, a fresh faced sprout, with agile legs, a muscled arm and smile to charm the world I went through in a rush to get a little older. Age erases pretense; replacing it with honesty. His photo showcased a rugged man’s man, a weathered face tanned and lined with character, short grey beard, and piercing eyes focused on the horizon and his next adventure. Never mind that he lived 400 miles away, sailed seas and lived with local natives and iguanas in places not found on any goggle map while I like home, get seasick and think roughing it is a weekend at a three star hotel. The online love fantasy lasted until a new first date shared that his goal was to travel the United States in his luxury RV and make love in every Walmart parking lot. I stifled my laughter and choked, Walmart? He leaned over the table towards me. I met him halfway. There are 4,000 Walmarts and I figure that should last me til I die. I stopped smirking and agreed that he had, indeed, a noble goal. Then, I looked him straight in the eye. Sometimes it’s so incredibly easy to fall in love over a cup of Starbucks. By far, most coffee dates are with Normal Men with whom there is no spark and most conversations follow what has become a pretty predictable drill in candidly sharing our experiences and thoughts. We wonder about the future. Given the wide range of backgrounds and experiences, it is actually quite amazing that most of us, in the post-sixty year old range, seem to have formed fairly similar opinions. We hate on-line dating, taking frequent breaks and returning only because it is so difficult to meet potential partners. We’ve all noted that the same faces continue to populate the sites, our own included. If we’ve been single for a while, we have concluded that we’re actually doing quite well, thank you very much…alone but not lonely. Still, we wonder a whole lot. We wonder what a relationship would actually look like. In our twenties, relationships were easy to define: two kids, a dog or cat, white picket fence…the path was there and ready to follow. We look to our parents’ generation and we’re certainly not them. So we wonder about the path in front of us and what it may actually look like, one day, some day.